Tonnages: 12,624 gross 6,754 net 19,902 deadweight. Main Dimensions: 530 x 71.3 x 31.9 feet. Cargo Handling: Fitted with six electric hydraulic deck cranes of 8 tons SWL suitable for grab handling. Engine: Goterverken oil engine 760/1500 U.G-7U 15 knots. 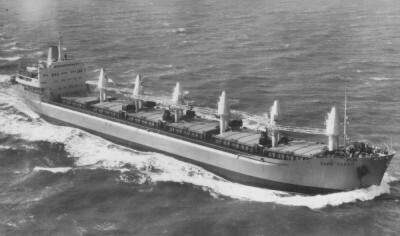 May 1967: Completed by Haugesund Mekaniske Verksted, Haugesund (Yard No. 30) for Lyle Shipping Co. Ltd., Glasgow. Maiden Voyage : Haugesund to Tampa Fla. Loaded phosphate for New Zealand. 1968:	Management to Scottish Ship Management Ltd., Glasgow. 1973:	Sold to Molena Trust Inc. Greek flag, renamed KIKI YEMELOS. 1975:	Sold to Kalma Maritime Enterprises, flag and name retained. 1982:	Sold to Kalkavan Transport Shipping & Trading Co Inc. Turkish flag, renamed HACI SEFER KALKAVAN. 2000: Repairs required. Class suspended from date of sailing Turkey 1/8/00. 15th December, arrived Alang, India for demolition.